If you've been dealing with spotty Wi-Fi in certain parts of your home, you can rejoice. Google just pulled back the curtain on a full lineup of new products on Tuesday, from a VR headset-ready smartphone poised to unseat the iPhone and Galaxy's camera supremacy, to an updated Chromecast that'll let you binge the best shows in mind-splittingly sharp 4K. However, it's the least-flashy new device of the bunch that really got us pumped. It's called Google Wifi, and it's a system of tiny tethered routers that will eliminate your home's dastardly dead zones forever. Hallelujah! 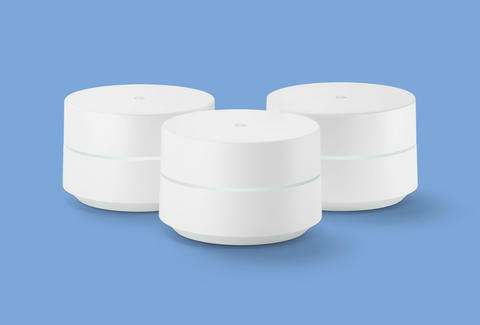 Although Google Wifi isn't the first multi-point router system out there, it is significantly less expensive than similar offerings like eero and NETGEAR's Orbi, setting you back just $129 for a single router, and $299 for a three-pack. How many you'll need depends on how big your place is: a single unit connected to your modem should be fine for apartments up to 1,500sqft, while a combination of three can provide lightning-fast coverage in every nook, cranny, crawl space, and attic in a 4,500sqft home. In addition to being low-profile and less invasive than prior offerings from the competition (each device is roughly the shape of a hockey puck), they're easily managed via a companion smartphone app, which'll also help you determine where precisely to place them within your space to ensure you're getting the best overall signal. Unfortunately, you'll have to slog through your subpar Wi-Fi for a little bit longer since it isn't shipping until December, but you can join the waitlist now so you don't miss out. Joe McGauley is a senior writer for Thrillist. Lol 56k.